It's hard to imagine a world not dominated by screens, but that may well be where we are heading. We are entering a new era of "Zero UI": not only is the technology already being invented, but emergent products and services are already in the market that will usher in this shift. Zero UI is a paradigm where our movements, voice, glances, and even thoughts can all cause systems to respond to us through our environment. At its extreme, Zero UI implies a screen-less, invisible user interface where natural gestures trigger interactions, as if the user was communicating to another person. Zero UI will also not be limited to personal devices but will extend to homes, entire cities, even environments and ecosystems, and as a result have a massive impact on society as a whole. It is a big component of the third wave in digital, which we call Living Services. What it will mean to live alongside or even "inside" them. 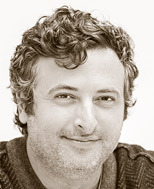 Andy Goodman is a Group Director and Design Strategist at Fjord, a design and innovation consultancy. Andy has been with Fjord since 2008, when he was director of service design in London. In October 2009, he established and oversaw Fjord's new studio in Madrid, which has rapidly become one of the most in-demand suppliers in the Spanish market. He is currently a Group Director and Design Strategist at our studio in NY, helping some of the world's biggest brands transform their businesses through design innovation. Andy is a futurist and digital native. In 1994, he wrote a documentary called "Secrets of the Internet." He created the first iTV services in the UK with Sky Interactive, where he was head of design. Andy and his team developed the first pay-to-play games suite for TV, which made millions of pounds in their first few weeks after launch. And as one of the pioneers of the service design industry, he is forever looking beyond the interface to create service experiences that shape the world in which people are beginning to live. He is a frequent speaker at global conferences and events, and his writing on emerging technology has been published in numerous magazines and books. When Andy isn't thinking about the future, he still tries to emulate great scientists, but his experimentation isn't in a lab. It's in the kitchen, where he is working on the perfect curry recipe.